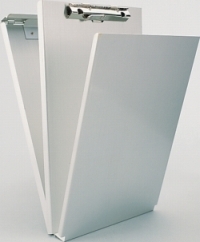 Aluminum Log Book and Carbonless Form Holder 572-R holder has a handy storage compartment with a clipboard-cover, plus an additional writing plate which folds down over the unit. By clipping a standard 5 1/2" W x 8 1/2" L log book onto the cover and positioning the writing plate underneath the desired number of plies, you can fill out a log book page without it copying over onto the next ply. Anti-microbial finish. Made from recycled aluminum.